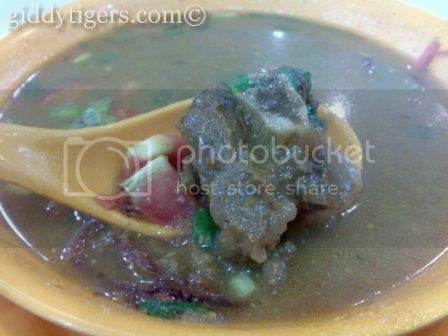 On the day before the petrol price increased to a high of RM2.70 per liter, I had sup kambing with steamed rice for dinner. The irony of it…a rather economical meal in view of tough times ahead. But truth be told, it was a rather tasty one at that too. Would I be eating this more often from now on, or (shudder) will I be instead eating instant noodles and plain white bread? On the day before the petrol price increased to a high of RM2.70 per liter, my hubby returned home from his game of futsal a whole hour later than normal. His game had started a half hour later yesterday evening because everyone was stuck in the jam caused by motorists queuing up to fill up their petrol tanks, right outside the futsal venue. And because our car was also running on empty, my hubby too had to join the crowd when his game was over. Typically, hubbs and I will not be one of those queuing up when rumors of petrol price hikes are announced, because we don’t think it is worth it. But we had to this time round. As an aside, I wonder if the price of Shell V-Power is relatively more than RM2.70 per liter. We use that in our car and if it is, it will mean even MORE tough times ahead. Actually, do you think the amount of petrol used by the idling and waiting cars last night while queuing up for the RM1.92 per liter petrol was offset by the ringgit savings they had made? Point to ponder…. So anyways, there’s a rebate of this petrol increase, I hear. RM625 per year for all private vehicles with an engine capacity of 2000cc and below. Unfortunately though, the RM200 reduction in road tax is only applicable to private petrol and diesel vehicles with engine capacity above 2000cc, so I can kiss this reduction goodbye. Bah. Beggars can’t be choosers, so I’m gonna make full use of the RM625 per year rebate. Is it true that our gahmen will pay us this rebate after we renew our road tax? Mine is due soon, so I will be looking forward to that. Can you imagine the things I could do with RM350.12?!!! Sigh…. I sure hope DAP’s calls for the price hike withdrawal will be approved. If not…..SIGH. I’m bracing myself for the impending electricity tariff restructure soon. Sigh Sigh Sigh…. This entry was posted in Thoughts & Scribblings. Bookmark the permalink. Not everything goes up.. The Malaysian Ringgit didn’t. The Giddy Tigress says: Hey, you’re right… it should go up too, huh? The Giddy Tigress says: Actually my financial advisor just informed me that it’s circa RM240 a month. Sorry….now it will be more lar. Dang! There goes the iPhone…. The Giddy Tigress says: You betcha. I didn’t bother queing up as well – I still have 1/2 tank left. But was caught in the traffic jam as there is a Shell just outside my area. Such is living here…..plus gomen says our inflation is only 3.3%! What a joke! The Giddy Tigress says: If I had half a tank left, I wouldn’t have bothered either. I told you the news was valid. I am also looking forward too to the RM625 end of the year. The Giddy Tigress says: This time it is, unfortunately. eh apparently the rebate hoh…is oni coming after u pay full amount :|…grrr. The Giddy Tigress says: Full amount? What do you mean? Won’t they pay you after your renew your road tax? give yourself 1 week or 2… see if your lifestyle really did take a plunge. i would think otherwise. The Giddy Tigress says: There may be some changes, though. And I’ll need to watch my spending.